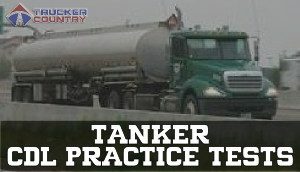 Free Online Tank Vehicles CDL Practice Test questions and answers to help you pass your state’s DMV Tanker Exam. There are 3 testing modes to help you prepare. Want to haul tankers? A tank vehicles endorsement is required for certain vehicles that transport liquids or gases. Our Tank Vehicles practice tests will prepare you to get this CDL endorsement. The liquid or gas does not have to be a hazardous material. A tanker endorsement is only required if your vehicle needs a Class A or B CDL and you want to haul a liquid or liquid gas in a permanently mounted cargo tank rated at 119 gallons or more or a portable tank rated at 1,000 gallons or more.